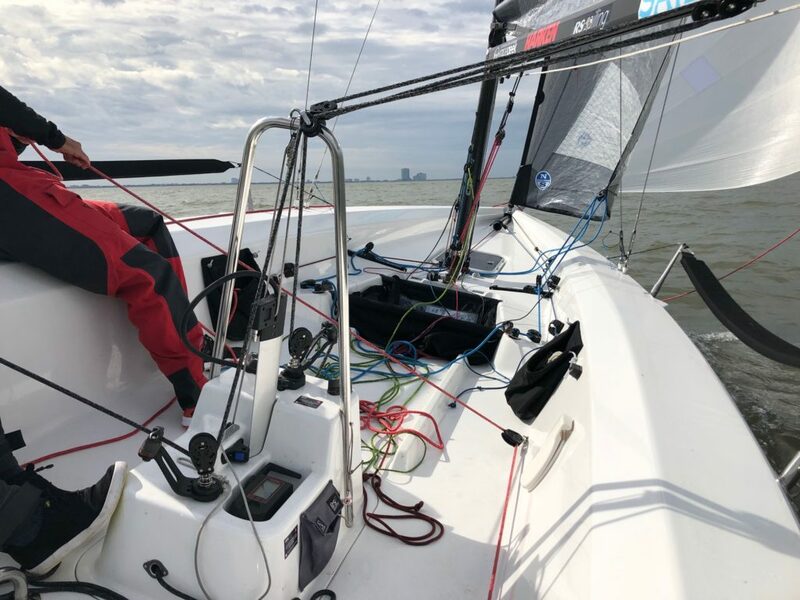 23 November 2018, New Orleans, LA — Frantically making sure all is set, dodging 200+ other dollied-Optis doing the same thing, just what does a parent do after their Opti-sailing child pushes off the dock at a USODA regatta? Those morning minutes of frenzied, nervous preparation are always followed by a sudden stillness, and often a long period of quiet waiting… the calm after the storm. Well, on this Friday at the 2018 USODA Optimist Midwinter Championship, hosted by Southern Yacht Club in New Orleans, Louisiana, this dad had the opportunity to gear up and go sailing himself. What a treat! 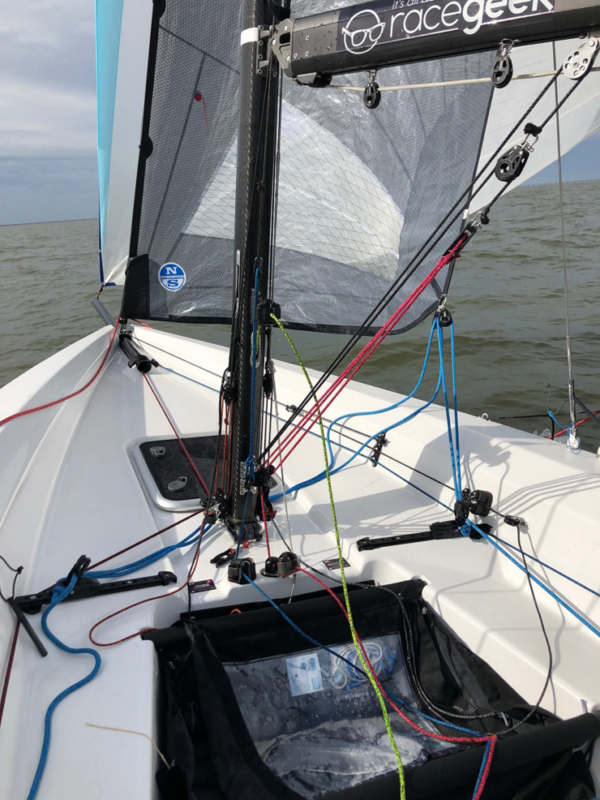 Thanks to KO Sailing, Zim Sailing, and Sail22, I had a chance to go out and sail the RS21 for a few hours on Lake Ponchartrain. 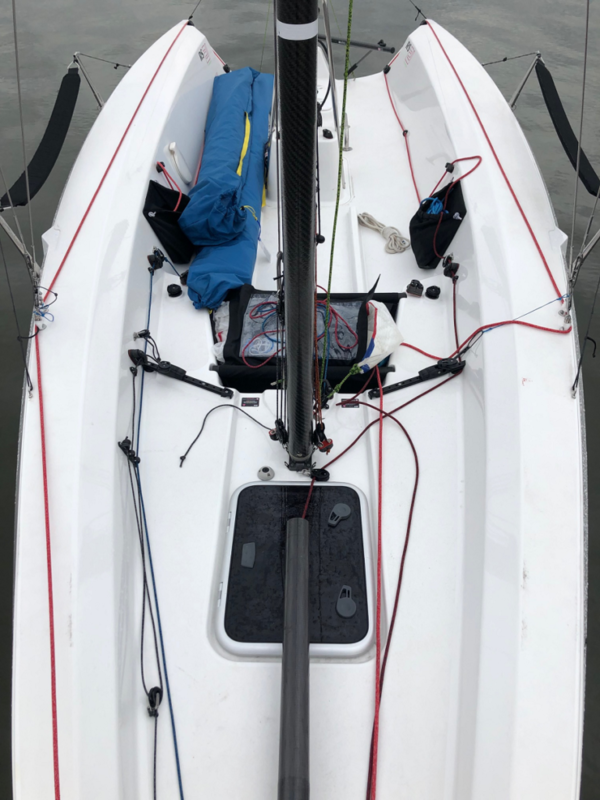 Jamie Gilman of KO Sailing rigged up the boat and graciously allowed me to drive, crew, and get a feel for the RS21, a new lifting-keel sprit boat. Coming along with us was 8th grader Ethan Polsen, a former Opti sailing star and an up-and-coming 420 sailor. This would be his first ride on a keelboat. Why another 20-22 foot Asymmetrical-kite sport boat, you ask? Good question. The answer is that while this boat looks like a sport boat, that’s not what it is; the RS folks had a clear, unique vision in mind when designing the RS21. The mission for this boat was to provide a stable, open, simple, fun, and durable keelboat that sailing and yacht clubs can use, ideally in small fleets, that is exciting but not overwhelming to attract their members, and new members, back out on the water and into sailing and sailboat racing. The boat comes standard without a spinnaker but an asymmetrical can be added for One Design racing, and she’s ready made to use a symmetrical spinnaker and pole, so it could be a great match racing boat as well. Class rules require foot-in hiking (no sitting with legs overboard) and the class strictly limits professionals on board. This boat is really meant for club members, and with the retractable keel, can be easily stored and trailered. We headed out in a 5-13 knot easterly, with the usual Lake chop. It took me a little time to get the feel of the boat upwind; I’ve not been sailing a whole lot lately. It did seem very civilized, easy going, and very well-mannered. Given the goals of the boat, that’s good news. It definitely has a groove upwind, and with time and attention to detail, crews that practice in this boat can find a little more speed, but it’s also really easy to jump in and go well. The RS21 is fairly stiff, and offers its crew time to react to puffs; this is a great for less experienced crews. While on our sail, I couldn’t resist hanging out for a few minutes at the Optimist race course leeward gate to watch some mark roundings. We luffed around, and slowed down to a crawl as I predictably searched for my son’s sail number in the sea of sails racing downwind. What I learned while doing this is that the boat has admirable upwind acceleration and feel while down-speed, and surprising feel while stopping and starting, etc. This is not always the case with high aspect bulb keel sport boats. Immediately I thought: hello team racing! 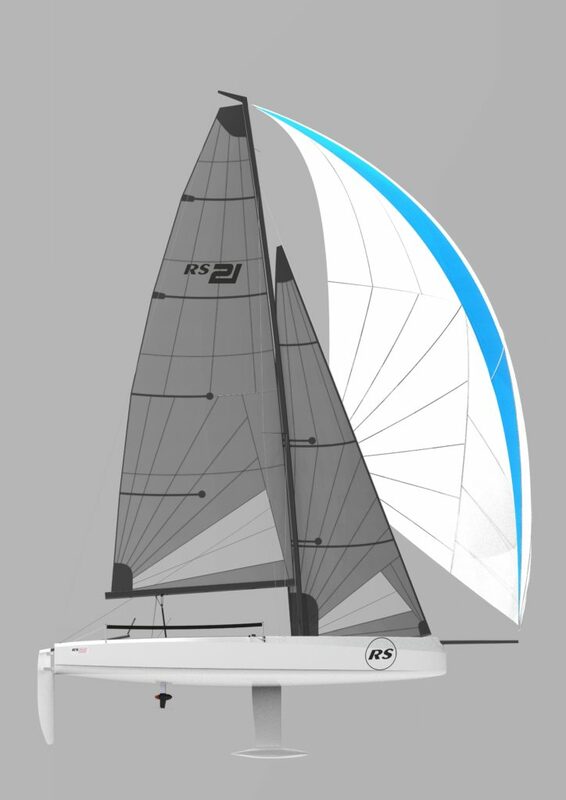 The RS21 really could be a FUN adult team race boat, where these qualities are key. Downwind, the boat seemed to come alive, and clearly had even more dinghy helm response, excellent acceleration, and a stable enough feeling for new sailors. The steering input was excellent, and allowed time and opportunity for the helmsman to bear off and avoid a broach. 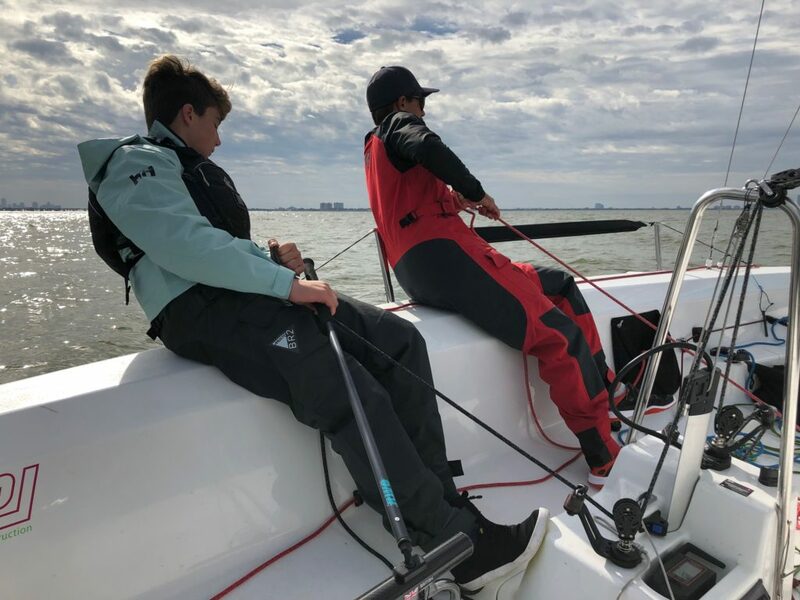 In fact, our 8th grader Ethan found himself driving the boat downwind in the breeziest part of our sail, and for a first-timer he sailed the boat with confidence and ease as we ate up distance downwind, our speed approaching 7-9 knots in about 12 knots of wind. The very large rudder certainly helps keep things calm downwind. Good choice, and well thought out. Easy, fun, and simple. Selden is the rig supplier for the RS21, and the boat sports a carbon rig (very similar if not the exact same section as the J/70), aluminum boom, carbon sprit. It’s certainly nice to have a mast that weighs a grand total of 40 pounds. The rig and sail controls are really quite simple, with most rig tuning controls in places where they can be reached easily. The mainsheet blocks are supported on a 3 ft center post, and led to two independent blocks with cleats, fore and aft of the post. 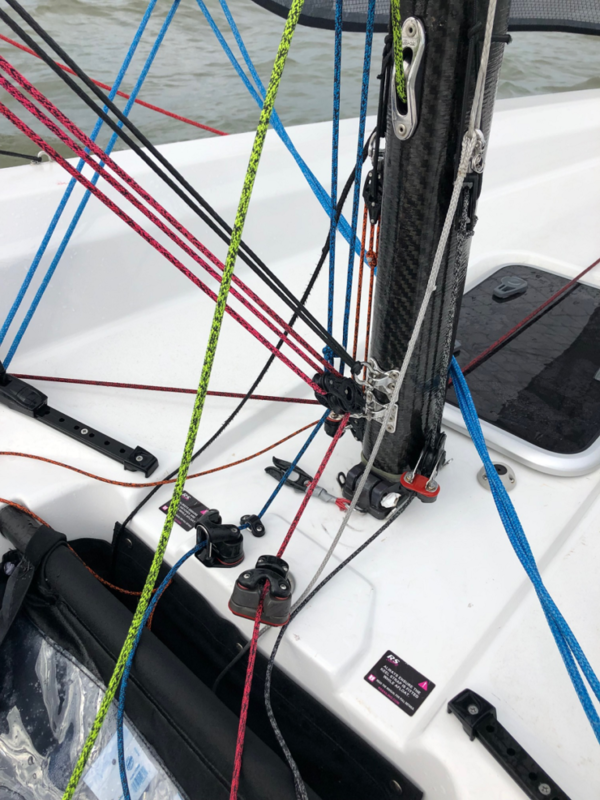 This nice touch allows trim from the continuous mainsheet from two location options with ease and ergonomic flexibility; so skipper can trim with the aft block, or a mainsheet trimmer can do so using the forward block. I am a fan of mainsheet travelers on keelboats for sure, and lack of a traveler definitely limits sail trim options. 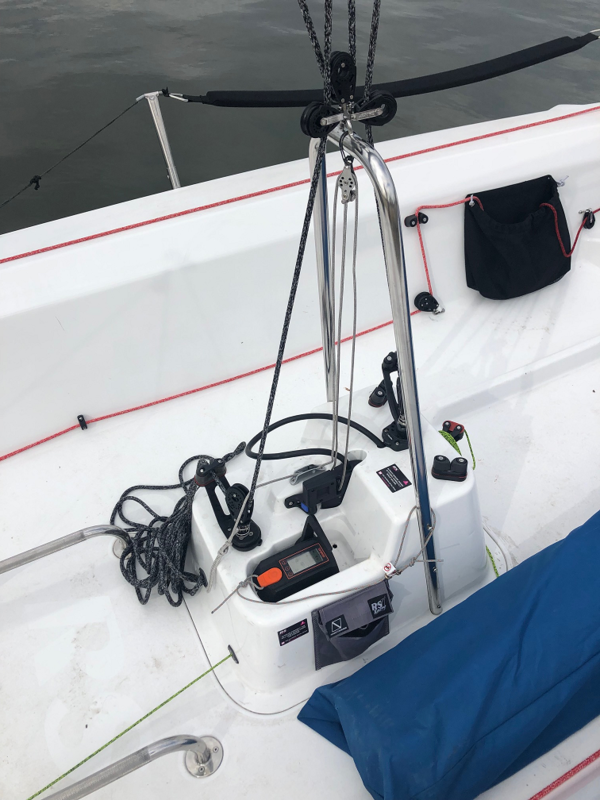 The good news is that the mainsheet block post offers something to grab onto in a pinch, a nice post-race backrest to lean on, and it certainly makes the sailing simpler with one less control to worry about. 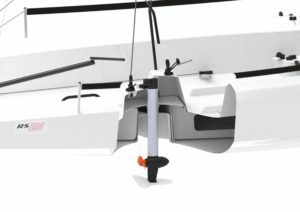 The backstay adjuster is set in the middle of the boat; I’d like to see it led to each side for more adjustment, but having it led to one spot makes sense for a boat that prioritizes simplicity. The spinnaker control systems are well designed and easily found. Nothing fancy here, and that’s a good thing. The three of us were able to set, gybe, and take down the kite with ease. This boat came equipped with the optional, really cool, lifting Torqeedo electric motor. 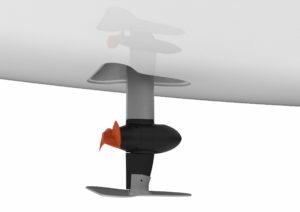 When deployed, the motor can run for as much as an hour, and while sailing it retracts flush to the hull, with the motor shaft positioned smartly guarded by the mainsheet post. This neat, easy system will provide a nice return-to-dock insurance policy for those days when the wind leaves you stranded. Overall, this is a modern-looking 20-foot keel boat with a clear mission to target and attract sailing and yacht clubs. Think 21st Century Sonar. With a simple layout, open, ergonomic cockpit and hull designed for a forgiving, stable ride, the RS21 presents a compelling option for institutions and clubs that seek a nice blend of speed & modern performance with ease of use. The RS21 can attract the top club sailors who seek a fun, responsive, speedy, and moderately tune-able boat. Be careful if you buy six; you will have your club members team racing in this boat in no time, and they may not want to stop! More importantly, given its stability and simplicity, it can also attract and introduce new sailors, safely, to the sport. 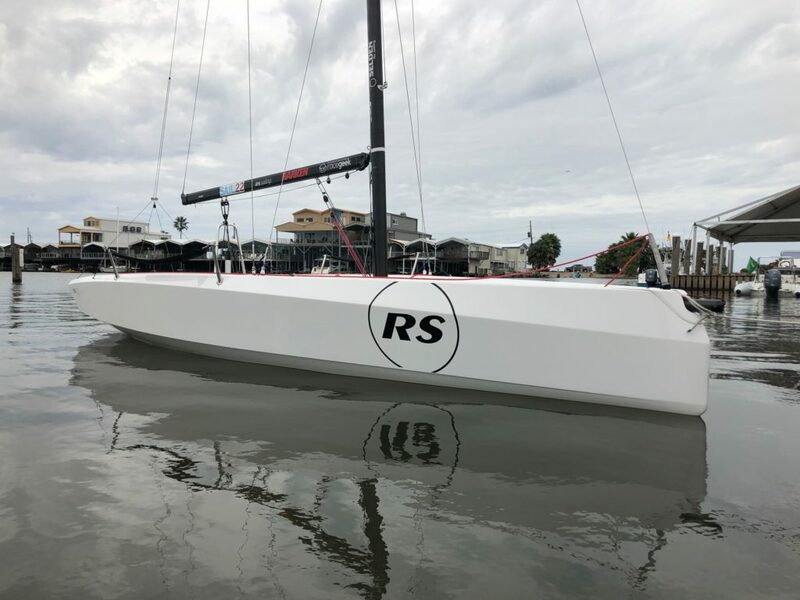 Sounds like a turn-key fleet of RS21’s will be available for charter at all the NOOD Regattas, Charleston Race Week, and other events to be announced in 2019; this would be a great opportunity to get to know the boat, and have some fun racing at the same time. Stay tuned for a press release for more details and visit www.rssailing.com/rs21na for updated North American news.